CREATION OF A STORY (SCENARIO) AND A PUPPET SHOW. All the members of the group have already gathered a variety of wrappings (cartons of milk, juice, coffee and tin beverages). 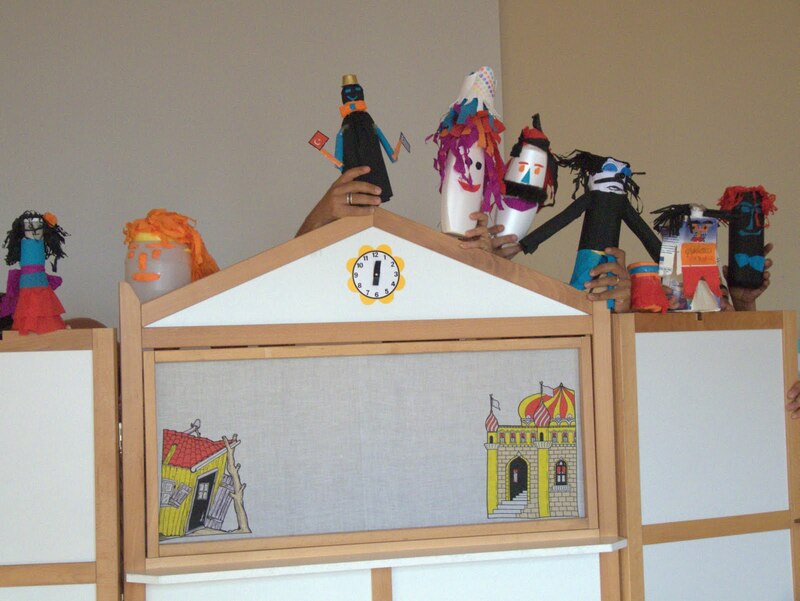 At some point we tell that the things that apparently look like garbage, can not be thrown away, but they can become alive, extraordinary and magnificent puppets or other objects than can be used for our puppet theatre. A story relevant to the topic is created by the team, which is working and by having that in mind they decide what kind of puppets will they create. They're given materials like: colors, scissors, cardboard, buttons, bottle caps or anything else we think it will be usefull for them. Each one creates his/her puppet or whatever object is necessary for the show. Next they move their puppets on a practising table, using the speech or singing or whatever music is needed, in order to make the story vibrate. Also we can, if we want, to follow a reverse course, which means first to manifacture the puppets and then be inspired by them for our story.